RICK ROSS continued his promo on The Arsenio Hall Show. 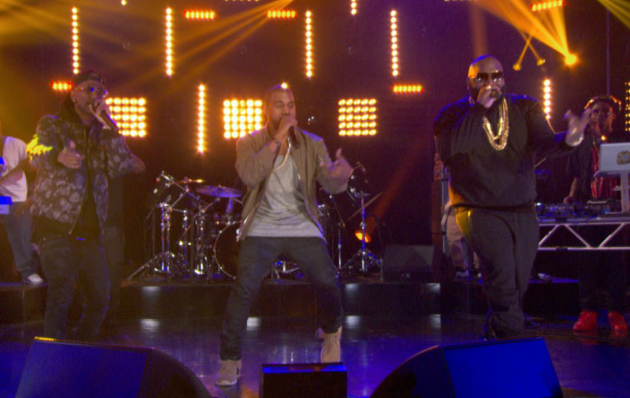 Along with special guests Kanye and Big Sean, the trio gave the first performance of their Mastermind collaboration. Posted in ARTIST, HIP-HOP, HYPE-ALERT, LIVE SHOW, MEDIA, MUSICTagged Arsenio Hall Show, Big Sean, Hypealertmedia, hypealertmedia.com, Kanye West, Mastermind Album, Rick Ross, The Arsenio Hall ShowBookmark the permalink.